Students in Years 7-9 make up the Junior School at Rosebud Secondary College. The curriculum is overseen by the Junior School Curriculum Leader who works with Learning Area Leaders to ensure learning programs are engaging, rigorous and align with the Victorian Curriculum requirements. Each Year 7 and 8 student works with the classmates and a range subject-specialist teachers to progress their learning. Year 7 and 8 students participate in a broad range of learning experiences through a variety of core subjects. Year 9 is a year of transformation for young people and our program is designed to support their transition from Junior Years to Senior Years, in preparation for life beyond school. Core curriculum: continuing to build essential knowledge and skills in key learning areas; Electives: providing opportunities for students to deepen their studies in a range of key learning areas, in preparation for the Senior Years; Learning for Living Program: focusing on the development of essential personal and social capabilities of our students and to broaden their understanding of the world around them; Central Australia Tour: to build connectedness with peers, promote resilience and curiosity, and explore our beautiful country. 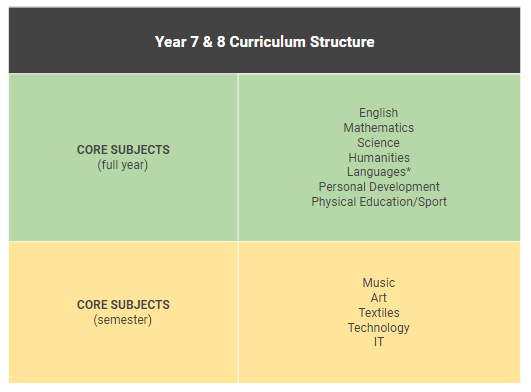 The Year 9 curriculum is enables our students to explore a variety of pathway options. We encourage our Year 9s to start thinking ahead to further study and possible career choices. 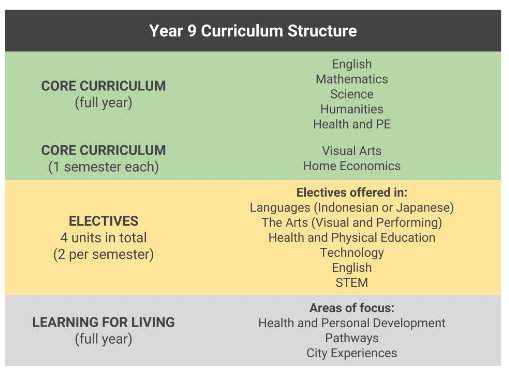 A thoughtfully selected Year 9 elective program allows students to deepen their knowledge, understanding and skills across a range of subject areas, in preparation for entering the Senior School in Year 10.